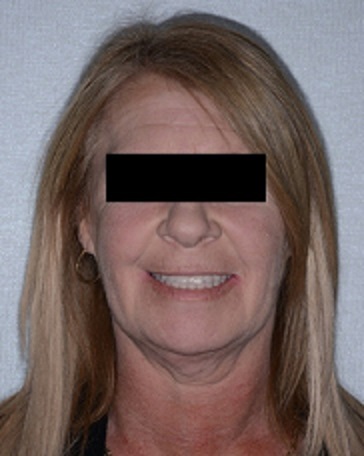 I always get great satisfaction from helping people who have lost their confidence and youthful appearance, because of failing teeth. Here’s a case I just had to share. I’ll call her Jill. teeth were so insecure and moveable that they were being pushed forward and splayed by her tongue, making her smile unsightly. 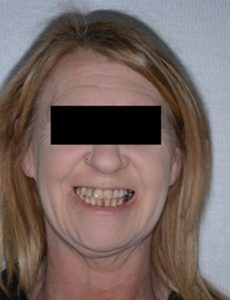 Jill was distraught – she hadhung onto her failing teeth from a deep reluctance to wear removable dentures, but when she came to see me it seemed that could no longer be avoided. It really was time for action, but I explained to Jill that the All-on-Four bridge could give her permanent dentures that functioned like natural teeth. Her remaining teeth were doing further harm to her gums, the underlying bone and her overall health so I recommended that we remove them and place implants at the same time. 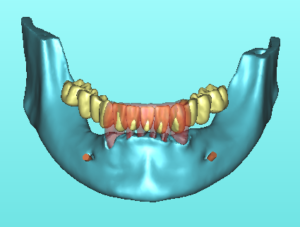 In Susan’s case I actually used 6 implants in each jaw. Later that week I fitted her with preliminary bridges. With our help, Jill had planned for the need to eat very soft foods only, for the first six weeks and less chewy foods until she reached the 12 week post-operative time frame where she could eat whatever she wanted. Something to smile about – Jill’s new teeth. Three months after the removal of her failing teeth, Jill came to see me for her final permanent bridges. Smiling and eating with confidence. 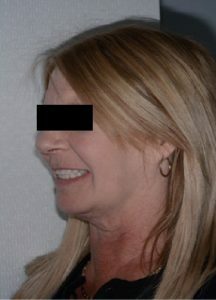 There’s usually the need for a little adjustment to the bite, but the implants were well integrated and all went extremely well, and Jill now had her permanent teeth. Jill is delighted with her All-on-Four restoration. She is scrupulous about following our care and cleaning regime, and reaps the rewards every time she looks in the mirror, or tucks into a steak with confidence.